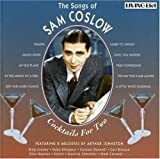 Sam Coslow began writing songs as a teenager and had his first hit song in 1920. But his career didn’t really take off until he and his music publishing partner sold their business and moved to Hollywood in 1929 where Coslow collaborated with Richard Whiting on “True Blue Lou” (1929) and with W. Frank Harling on “Sing You Sinners” (1930). His most successful collaboration was with composer Arthur Johnston with whom he wrote a series of hit songs for films. Bing Crosby introduced several of their songs, including “Just One More Chance,” their first big hit from the 1931 film One More Chance. Crosby’s recording went to number one on the charts, and a second recording by him in 1939 also charted. He introduced “Thanks,” “The Day You Came Along,” and “Learn to Croon,” in two 1933 films. “Moon Song” was another hit for Coslow and Johnston in 1933, and “Cocktails for Two” was introduced in the 1934 film Murder at the Vanities. Spike Jones and His City Slickers also turned it into a comic novelty tune that forever changed the perception of the tune for people familiar with Jones’ version. That same year “My Old Flame” appeared in the Mae West film Belle of the Nineties in which Duke Ellington played a piano player. In 1946 Coslow wrote both words and music for “Beware My Heart,” introduced by Vaughn Monroe. Coslow was also a recorded singer, a movie producer, and a manufacturer of Panorams, coin-operated machines for showing 3-minute musical films called “soundies.” In 1943 he and co-producer Jerry Bresler won an Oscar for Best Short, Heavenly Music, to which Coslow also contributed songs. He produced two feature length musicals in 1945 and 1947: Out of This World and Copacabana. When he retired from the music business he returned to publishing.